The recent story of Canadian real estate developer Bob Dhillon purchasing the ‘sword of Maharaja Ranjit’ Singh’ at auction last month for reportedly close to six figures has been making the news lately and caused a lot of excitement among the Sikh community. Over the past decade or so the valuation of Sikh artifacts at auction houses around the world have gone through the roof, far exceeding the objects estimated auction value. With great enthusiasm and euphoria among Sikh collectors, the auction houses have noticed and catered to this growing phenomenon. In 2007 a marble bust of Maharaja Duleep Singh produced in Rome in 1859 sold for a staggering 1.7 million pounds, nearly 60 times more than London auction house Bonhams had valued the sculpture at.The Sikh auction market is certainly red hot, and therein lies a cautionary flag for potential investors and collectors. Noticing the extreme selling price achieved at the Bonhams auction in 2007, priemier auction house Sotheby’s tried to also cash in on the action a year later. In 2008 they offered for auction a Char-aina (literally 'four mirrors') body armour side plate with gold overlay Gurmukhi and floral decorations that was claimed to have belonged to Guru Gobind Singh. There was tremendous interest around the world and if this auction would have proceeded, it would certainly have set a new record. There was also a tremendous hew and cry among the Sikh community that such an important artifact should not fall into private hands. There was even a call by the SGPC for the Queen to intervene and stop the auction from proceeding. With all the hysteria surrounding the auction of ‘Guru Gobind Singh’s armour’, Sotheby’s was forced to clarify that is was NOT the armour of Guru Gobind Singh, Sotheby’s clarified that this had been a misunderstanding and misreading of their auction item description in the catalogue. They said that they only claimed that the armour for sale had a stylistic similarity to a set of armour attributed to Guru Gobind Singh belonging to the Patiala royal family. Of course most Sikhs missed this nuance in wording. Sotheby’s released the following statement at the time, “Sotheby's has not found or been given an evidence to indicate ownership of this piece by Guru Gobind Singh and we therefore do not deem the piece to be a relic of the Guru…The verse inscribed on the armour-plate had been originally composed by Guru Gobind Singh, although it has no necessary or exclusive connection to armour belonging or attributed to the Guru." Sotheby’s eventually ended up withdrawing the armour from the auction. The lesson to be learned here is that we need to be cautious when high profile Sikh artifacts come up for sale at auction houses and make sure that there is extensive due diligence done by knowledgeable historians and subject-matter experts to thoroughly collaborate, authenticate and track the provenance of these Sikh artifacts before well-meaning Sikh collectors get into sky-high auction bidding wars. Which brings us to the current issue of the sale of a sword attributed to Maharaja Ranjit Singh by British auction house Mullock’s. First a little bit of background on auction houses selling Sikh artifacts. Mullock’s. In terms of selling Sikh artifacts would be considered in the third tier. Sotheby’s and Christies are the two largest powerhouses in the first tier that usually sell very important and high priced Sikh artifacts (typically in the $10,000 to $50,000 + range). Bonhams would be considered in the second tier in this hierarchy, they sell Sikh artifacts which usually sell in the $5,000 to $10,000 range typically (excluding the Duleep Singh bust of course). Then you have third tier auction houses like Mullock’s, the Sikh artifacts that they sell are typically in the few hundred dollars to $3,000. Mullock’s would be considered one tier above ebay in terms of types of Sikh artifacts that they sell and valuations realized. So it was quite surprising to see a ‘sword of Maharaja Ranjit Singh’, such an important Sikh artifact being offered by a third tier auction house that normally deals with Sikh items worth a few hundred to few thousand dollars. You would expect the ‘sword of Maharaja Ranjit Singh’ to be put up for auction by its seller at a more high profile international auction house like Sotheby’s or Christies to maximize its sale potential. It seemed a bit odd. I am concerned and hope that the euphoria and excitement surrounding the auction of the ‘sword of Maharaja Ranjit Singh’ in not the ‘Guru Gobind Singh armour’ auction fiasco, being repeated again. A careful reading of the Mullock’s auction catalogue description of the sword never states that it is a sword that belonged to Maharaja Ranjit Singh and no provenance is provided in the description connecting its past ownership to Maharaja Ranjit Singh or the royal court of the Sikh Kingdom. All the catalogue description says is, “India Punjab – Sword inscribed Maharajah Ranjit Singh – early 19th century Northern India curved talwar sword inscribed in Punjabi script inside the hilt ‘Akal Sahai Ranjit Singh Lahore’ and dated.” Furthermore the description mentions an engraving depicting the Maharaja on the blade with the label ‘Ranjit Singh’ in Gurmukhi below the image. Somewhere and somehow the jump was made by someone connecting this sword with actual ownership by the Maharaja, yet no such connection has been made anywhere in the description of the sword by Mullock’s. Once that connection was made and the media and social media started the hype that the ‘sword of Maharaja Ranjit Singh’ was being offered for sale at auction, Sikh collectors around the world became excited and it resulted in a frenzied global bidding war.Let’s take a moment to step back and look at swords that we know where owned by Maharaja Ranjit Singh. Fortunately there are a number of surviving examples with full provenance in various museum collections around the world. I know of four such swords, and I am sure there are a few more in other museums and private collections. A sword belonging to Maharaja Ranjit Singh that he presented to Captain Robert Browne has an exquisite jade handle with rubies set in gold for eyes. In the center of the quillion is a miniature portrait on ivory of the Maharaja adorned with rubies. The steel blade is decorated with finely executed hunting scenes, while the scabbard is richly embellished with rubies and emeralds in a gold setting. 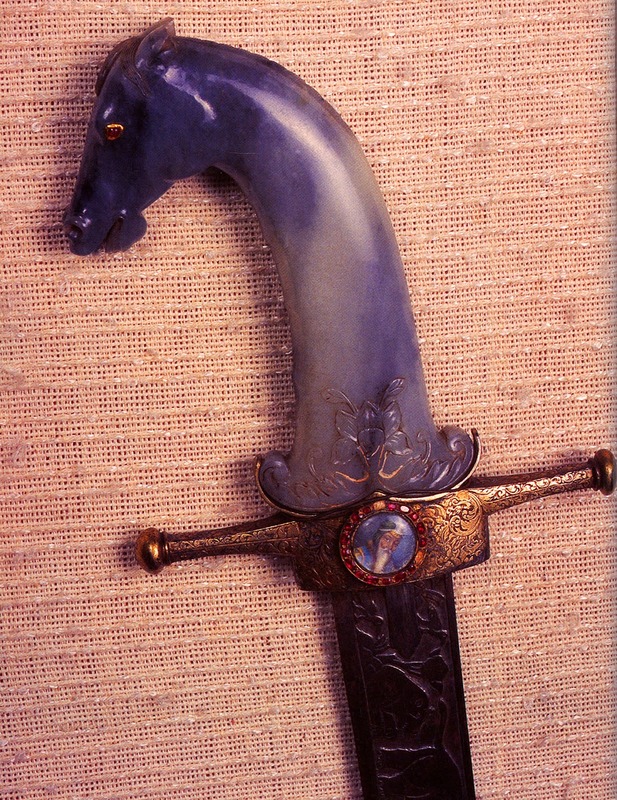 This sword is in the Maharaja Ranjit Singh Museum in Amritsar. This sword is in the Maharaja Ranjit Singh Museum in Amritsar. A sword belonging to Maharaja Ranjit Singh in the Wallace Collection in England features a handle of rare and exotic walrus ivory imported at tremendous cost from northern Europe. The sword also features gold, agate, pearls and semi-precious stones and a scabbard of gold. 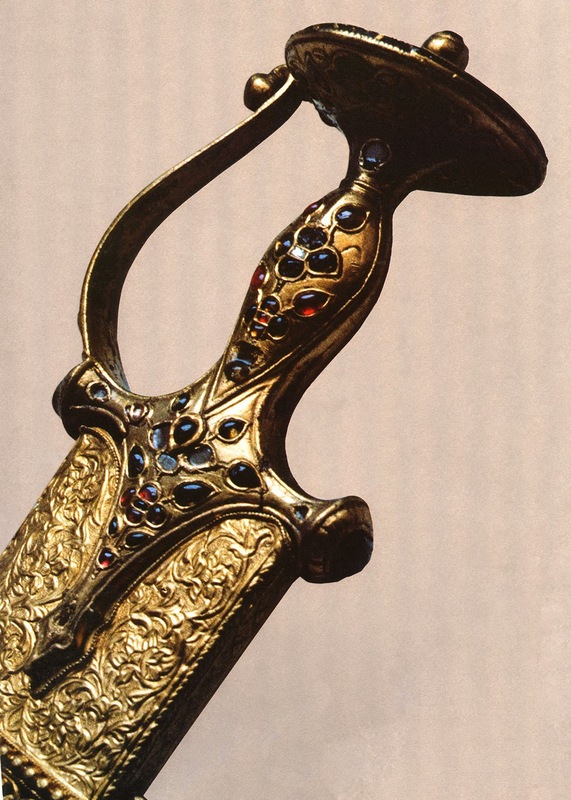 Another of the Maharaja’s swords has a golden hilt studded with rubies and emeralds and a scabbard of gold work. It is kept in the Tosakhana treasury at the Golden Temple in Amritsar.Besides these four swords there is also a sword belonging to Maharaja Ranjit Singh’s general, General Allard, in a private collection which has an exquisite handle of ivory and gold with embedded precious stones. This sword is representative of the typical types of swords found at the Maharaja’s royal court. All of these surviving swords that belonged to Maharaja Ranjit Singh have one thing in common. Although they may be different types of swords, one a shamshir, another a tulwar, for example, what they all have in common is that they are bejewelled items of the highest craftsmanship imaginable, befitting an Emperor of the stature of Ranjit Singh.The late Dr. Leo S. Figiel, a San Francisco based collector, spent a lifetime building one of the finest collections of swords belonging to the various Maharajas and rulers of South Asia. The auction catalogue of his vast collection published by auction house Butterfield in 1998 is regarded by many researchers as one of the great reference works on the swords of India (Egerton and G.N. Pant come to mind as two other important reference works). Flipping through Dr. Figiel’s auction catalog one finds the exquisite craftsmanship and the heights of the sword makers’ art that was demanded by Maharajas for their personal swords. The verified surviving swords of Maharaja Ranjit Singh are all entirely consistent with the high degree of craftsmanship and decorative art found in Dr. Figiel’s auction catalogue.Maharaja’s swords, like those owned by Ranjit Singh were an expression of their authority through the magnificence of a finely crafted art piece as well as functional weapon. Their swords were a status symbol and no ordinary looking sword would do for a Maharaja. It had to be outstanding in craftsmanship. All of Maharaja Ranjit Singh’s swords were covered with gold, diamonds, rubies, emeralds, and exotic materials including jade and ivory. Any engravings or lettering on the hilt or blade were of the highest precision. Even the scabbard of the sword was decorated with gold and precious stones.Corroborating the physical swords of Maharaja Ranjit Singh that still survive we also have a handful of paintings of the Maharaja that are verified to have actually been done during his lifetime and which clearly show his sword in the image. Although we today have many 19th century paintings of Maharaja Ranjit Singh, many of them date to a time period after his death. Maharaja Ranjit Singh was very conscious of the small pox that marred his face and right eye and seldom allowed himself to be painted. Of these rare early paintings, any that shows the Maharaja’s sword, typically show him wearing a decorative gold and jewelled sword and similarly decorated scabbard. For example there is a wonderful painting of Ranjit Singh standing, done between 1815 to 1820 which shows his jewelled and gold sword in clear detail. Another painting dated 1830 shows the Maharaja on his throne with a decorative sword as well as kataar punch dagger. Both of these priceless paintings are preserved in the British Library. What about when the Maharaja was younger? The earliest known painting of the Maharaja dated to 1810 and showing the Maharaja meeting the Maratha chief Jaswant Rao also clearly shows a highly decorated and jewelled sword and scabbard in Ranjit Singh’s hands. This painting is in the British Library. An examination of auction photographs of the sword offered by Mullock’s reveals a sword quite unlike any of the other known swords verified to have once belonged to Maharaja Ranjit Singh. The Mullock sword is of a simpler and more rudimentary design. It sports no diamonds or emeralds, or rubies or gold or any precious element. 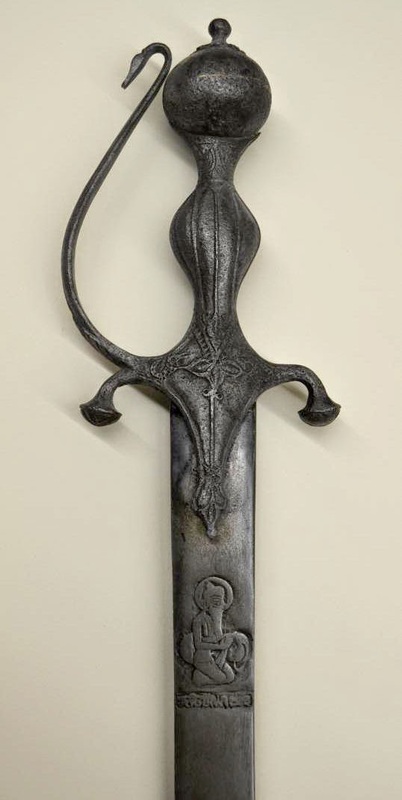 The hilt contains a simple floral design in steel and the Mullock’s description states that this may be an earlier 18th century hilt. That may indeed be the case and the hilt may be from the earlier Mughal era before the Sikh Empire and may have been gold plated at one time. Unlike the jewelled scabbards of the swords of the Maharaja in various collections, the Mullock’s sword is described as having only a leather covered scabbard. In terms of the Gurmukhi lettering on the sword, unlike the intricate gold lettering found on some of Ranjit Singh’s swords and armour, the Mullock’s sword features crudely etched lettering. Illustrations on a sword blade belonging to Maharaja Ranjit Singh in the Maharaja Ranjit Singh Museum in Amritsar feature a finely crafted stunning scene of various animals on the blade created by a master craftsman. By comparison the Mullock’s sword has a very crudely drawn and almost cartoon like outline of Ranjit Singh on the blade lacking any relief details, clearly not the work of a master craftsman. The Mullock’s sword bears all the hallmarks of a sword possibly produced by a provincial craftsman for a local patron, perhaps a village chief or land lord. The craftsman many have used an older Mughal era hilt and added a sword blade and then crude letterings and illustration to the sword. It may have been commissioned by its owner as a tribute to the Maharaja or perhaps produced as a souvenir. Mullock’s auction description indicates there is some evidence of the handle having once been gold plated at some time in the past. Gold is typically melted or removed from jewellery or an object when the value of the gold is higher than the value of the object itself. If this really was a sword belonging to Maharaja Ranjit Singh, its value as such at any given time would have been ten-fold compared to a few ounces of melted gold. The gold would never have been removed by someone unless they knew that the sword was not particularly important or valuable. The gold, diamonds, rubies, emeralds and other precious elements have never been removed from the known surviving swords of Maharaja Ranjit Singh. Whatever the Mullock’s swords may be, we can say with certainty that it is not consistent with the quality and craftsmanship of the surviving swords known to have belonged to Maharaja Ranjit Singh, or members of the royal court of the Sikh Empire.It is very important that well-meaning Sikh collectors who are doing their best as are researchers like myself to preserve and showcase Sikh heritage, take the extra steps necessary to ensure that they do their due diligence and consult with historians and subject matter experts in Sikh artifacts before getting carried away in the enthusiasm and excitement of Sikh auctions. Are the descriptions of items offered at auction houses always correct and can they be taken as infallible? Not necessarily, I know this through my personal experience as I have on occaion been asked by major top tier auction houses to provide my expert opinion on specific Sikh items that they were planning on selling. In one case they had mis-identified a painting of a battle scene as being Sikh soldiers, when they were actually Muslim soldiers. In another case they had erroneously described a painting as being of a Sikh Guru, when I identified it as actually a painting of a Patiala Raja. In my most recent involvement last year a painting purported to be of Maharaja Ranjit Singh was actually not the Maharaja at all. Although I don’t consider myself an expert on Sikh arms and armour I am happy that I have been able to contribute something to the field with the ground breaking exhibit ‘In Search of the Sikh Helmet’ launched at SikhMuseum.com last year. To date this research work found in the exhibit is one of the most detailed examinations of the usage of battle helmets among 19th century Sikhs, including the famed turban helmet. As a community we have a growing number of historians and researchers who are specialists in various aspects of our history and cultural heritage. Mullock’s is a British based auction house and it is ironic that two of the best subject matter experts that I can think of on Sikh arms and armour are based right there as well; Runjeet Singh a dealer who runs Akaal Arms and passionate collector Davinder Singh Toor. Both Runjeet and Davinder are great examples of the types of folks of the highest caliber subject matter expertise that we have in our community and it is important that enthusiastic well-meaning Sikh collectors seek out such experts before investing in high profile Sikh items offed for sale at auction houses or by dealers.